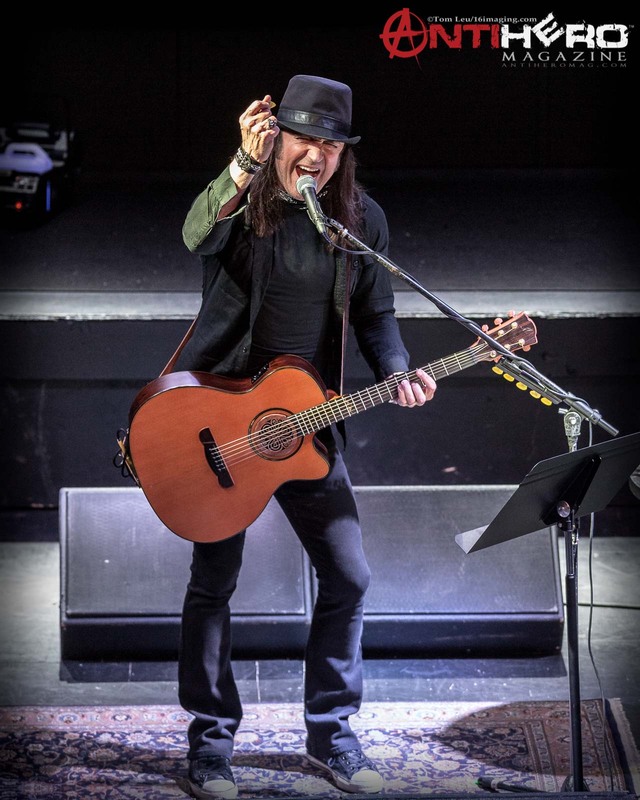 The Forge of Joliet, IL (a renowned IL rock club that has gone by different names over the years) hosted an excellent and inspiring solo acoustic show on August 5th, 2017 featuring the headliner, Stryper frontman, Michael Sweet, along with The Last Vegas and Black Actress guitarist, Bryan Wilkinson in support. Decked out in a black fedora and custom Chuck Taylor Converse kicks, Michael delivered a semi-chronological set consisting of Stryper classics from the albums Yellow and Black Attack, Soldiers Under Command, To Hell With The Devil, In God We Trust, and Against the Law. I enjoyed the fact that in addition to the predictable hits he played from some of Stryper’s back catalog, he also pulled out a few re-imagined deep tracks such as “Reach Out” from the Soldiers album. Michael also pulled from his extensive solo catalog offering up tracks from the albums 1994’s Michael Sweet, 200’s Truth, and 2014’s I’m Not Your Suicide. Arguably as impressive as his continued prolific output of new material seemingly every year (from Stryper, Michael Sweet solo, and Sweet & Lynch) is Michael’s consistently strong vocals, complete with the requisite high notes that die hard Stryper fans have come to love and expect. Now in his mid-fifties, Michael Sweet shows no signs of slowing down. Michael also cherry-picked choice covers to perform for the sing-along crowd including Bon Jovi’s “Livin On A Prayer” (which he said is the one song he wish he’d written because it’s “the best song about prayer ever” he said jokingly…), Boston’s “Amanda” and “Peace of Mind” were crowd favorites and along with nothing but high praise about his time in the band back in 2008. Michael used loopers for backing tracks and rhythm accompaniment which filled things out nicely, and added another dimension to this acoustic-guitar only show. My only criticism of the night was that cuts from the two most recent Stryper albums, 2013’s No More Hell To Pay and 2015’s Fallen, as well as anything from his latest and excellent solo album, 2016’s One Sided War were conspicuously missing from the set. The end of the night saw Michael signing autographs and snapping cell phone pics with every last fan who waited in line to see him. Always affable and approachable, Michael Sweet is a class act! Check out my two previous AntiHero Magazine interviews with Michael HERE talking about his solo album One Sided War; and HERE discussing Stryper’s 30th Anniversary of the To Hell With The Devil Album. Best known currently as the guitarist for Chicago’s Black Actress and The Last Vegas, I had the opportunity to interview Bryan Wilkinson before his opening set at The Forge. 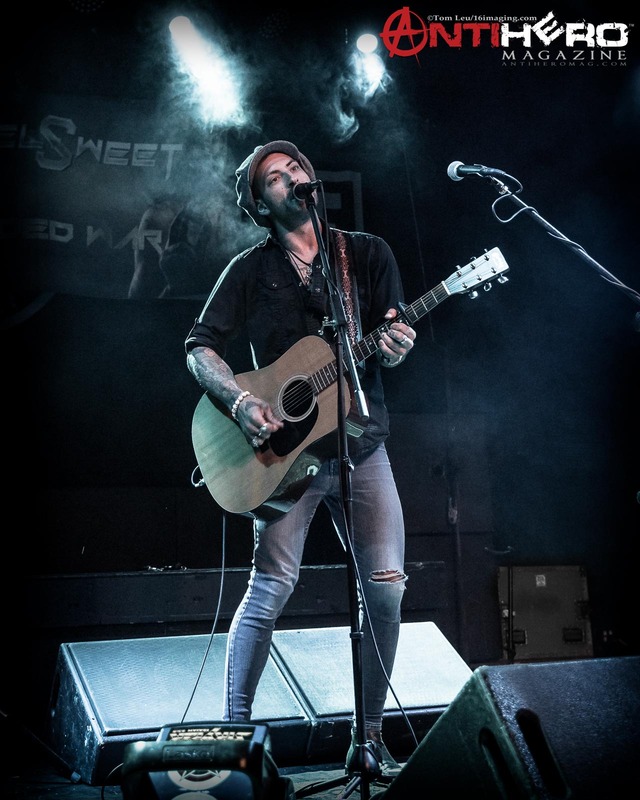 Seemingly far from the tattooed and tortured rock star cliche, Bryan’s a relatively soft-spoken, but thougtful artist who has a clear vision of who he is, and where he wants to go with his music in any of the various formats he performs in currently. I found him refreshing to talk to both as a musician, and as a person. Bryan brought an inspired and powerful 30 minute set of solo cuts that crossed the spectrum from more subdued singer-songwriter style selections, to cuts that I could hear blasting out of Marshall stacks at a TLV or Black Actress show. Bryan sports strong, bluesy vocals that really cut through and have an identity of their own song-to-song. Stand out tracks included the melodic and moody, “Stuck in a Mirror” and “Save Me” that’s also recorded full band with TLV’s the Arling brothers featured as the rhythm section. Bryan’s talent as guitarist, singer, and songwriter, coupled with his strong work ethic, should be the template for any up-and-coming musician out there attempting to carve out their place in today’s music business. Bryan W. is doing it right… check him out. >> SOUND MATTERS Radio… Music & Motivation Talk with TOM LEU airs Saturdays on 1440 WROK radio. The show also streams live via the free Radio Pup app for iOS or Android HERE, and is available on-demand on iTunes HERE, and iHeartRadio HERE.